People in Seattle seem to think roofs are only there to keep the rain off them... not for frivolous things like “getting a drink on” or “enjoying the weather atop of." 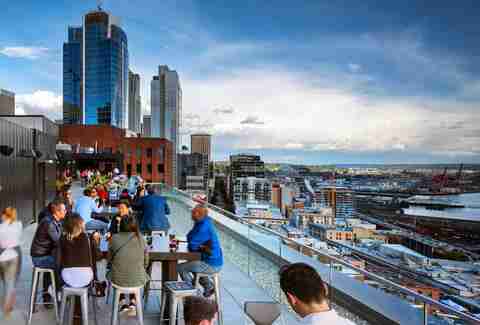 Luckily, there are a handful of establishments willing to brave the elements to give you a place to drink with views of the city. 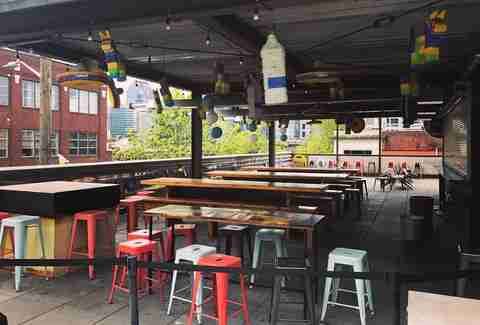 And we've tracked them down for our list of the best rooftop bars in Seattle. 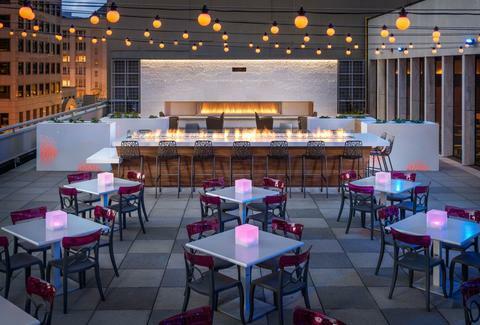 Five stories above 4th Ave, in what used to be The Red Lion, this sprawling indoor/outdoor drinking destination is 4,000 square feet full of fire features, Gatorade-colored ping-pong tables, and plenty of summery cocktails -- even when it doesn't feel like summer out. Seattle Is Having a Cider Boom. These Are the Best Spots to Drink It. 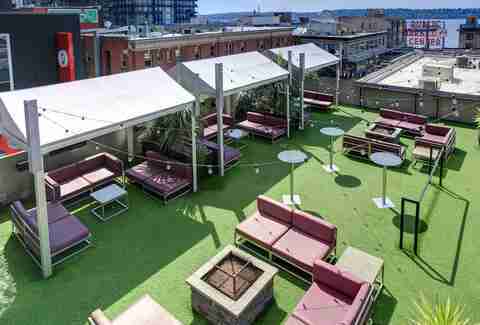 A welcome addition to this Vietnamese mainstay on the back side of Cap Hill, Monsoon's roof deck makes the thing they do best -- brunch -- even better. Enjoy steamed BBQ pork buns, and some of the city's best pho (get the beef round/brisket version) under the morning sun, while a breeze gently blows through the trees lining 19th St below, and the frustrated curses of people looking for parking under said trees recede gently into the background. Named after a pipe tobacco and boasting a slightly nautical theme, this neighborhood bar provides customers with a glorious array of fried foods as well as street eats from Three Keys, who are serving chicken & waffles, decadent cheesesteaks, and more from a window in the wall Monday through Thursday. 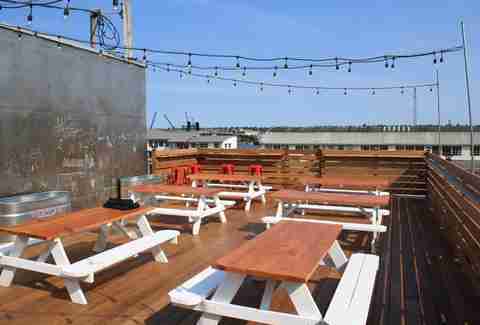 Oh, and CB's also provides the perfect place to consume all that: a rooftop deck complete with views of Seattle's skyline. Opened in 2015, this rooftop patio equipped space down the street from their tiny, rooftop patio lacking original location features 10 taps pouring a rotating selection of at least 13 brews, including a pair of IPAs, a couple of pales (including a coffee-infused one on nitro), and an impressive variety of other styles, all of which taste just a little better each time you catch a glimpse of Salmon Bay and the Fremont Cut between the buildings across the way. Yes, it's a Hard Rock. And yes, it's mostly for tourists and out-of-towners who don't know better. 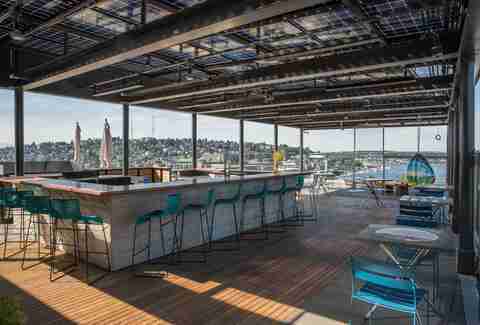 BUT it does boast a pretty phenomenal astroturf topped rooftop bar, complete with cabanas, a fire pit, and commanding views of the Pike Place, and Elliott Bay behind the market's famous neon sign. 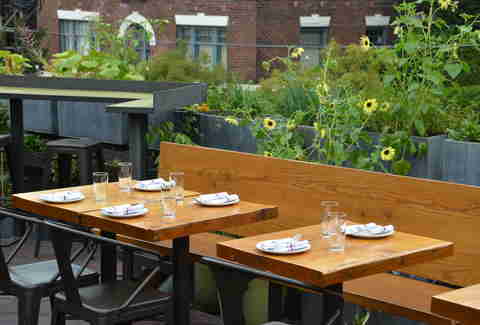 Everything on this stunning, triangular-shaped restaurant's "earth to plate"-inspired menu tastes better when you're surrounded by an edible garden, one story above the considerable fray of the always bustling Melrose Market. Especially the water buffalo burger, or the Monday Night Paella. 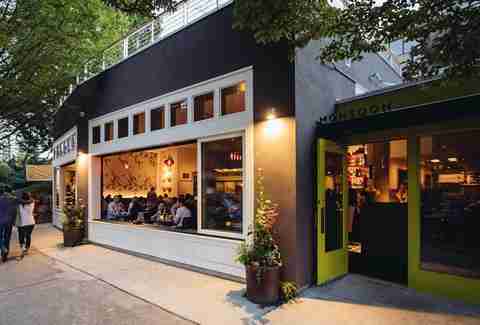 MO's second, and much more sprawling location in Pike/Pine, features a sleek, mostly black bar inside and most importantly, a vibrant lounge on the roof. In either area you can expect to be plied with an almost endless array of margaritas and seriously delicious Mexican street food, including enfrijoladas that aren't to be missed. Set away behind the mongers throwing fish in the Pike Place Market, it's easy to overlook this charmingly authentic French restaurant… but it's impossible to forget once you're ensconced at a table overlooking the waterfront eating escargot in garlic & parsley butter. Like the rest of the beguiling Post Alley eatery on which it sits, this most unlikely of all Seattle's rooftop decks is reached by going down a long staircase, though a trapeze-equipped dining room (they host burlesque shows at night), and out onto the patio which is both below street level and breathtakingly above what few streets remain between it and the waterfront, giving you the sense that you're safely hidden away, and sitting on top of the world, at the same time. Perched atop the new Thompson Hotel, this 12th floor space serves a selection of snacks from the people behind Westward (skewered meats, mix-to-order poke, etc. ), as well as bottled and craft cocktails poured over house-made pieces of ice, but who are we kidding? You're there to drink in the seriously stunning views of the city and Elliott Bay, which make this a can't-miss destination. Helmed by the people behind Mamnoon, this 14th-story spot is accessed through a small street-level bar/waiting room. From there an elevator takes you to a short windowed corridor strewn with neon light that opens into a sprawling 2,800sqft space -- two-thirds of which is outside -- where, in addition to Middle Eastern fare from noted Seattle chef Jason Stratton, you will also enjoy unparalleled views of Seattle Center and the Space Needle, Queen Anne, and Lake Union just two blocks to the north. Despite opening in 2015, this surprisingly intimate cocktail bar and dance music destination with a polished industrial feel and a seriously good sound system has managed to fly a little bit below the radar despite consistently booking talented DJs, and boasting an after-hours roofdeck (open til 4am) that features a fireplace, multiple seating areas, and sweeping views of the skyline in the distance. Sign up here for our daily Seattle email and be the first to get all the food/drink/fun in town. Bradley Foster is a former Thrillist editor who pretends to be surprised when the burlesque starts every time he takes a date to The Pink Door.